For generations the Stirwaters Mill has been run by members of the Miller family, passing down the line in a weird zig-zag from uncle to nephew to distant cousin. Some say there's a curse on the mill and that's why no Miller son has ever lived long enough to inherit the mill. But Charlotte Miller doesn't believe in curses, even when her beloved father dies young and without a will, the mill passing by default to her. Charlotte and her sister Rosie are the last of the Millers and they are determined to keep the mill going. It employs many of the people in the village and the Stirwaters name still carries some weight. Charlotte doesn't find it easy to run the mill. First of all, no one outside the little village of Shearing will take her seriously. And secondly, the mill seems to be bent on destroying itself somehow. Repairs never seem to take, machines sometimes refuse to work, and unlocked doors stick shut for no reason at all. A series of misfortunes leaves Charlotte fearing that she might lose Stirwaters... until a mysterious stranger shows up and claims that he can help them... for a price. 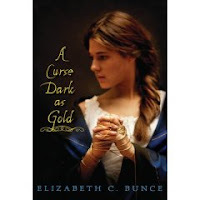 Ms. Bunce takes a familiar fairy tale and fleshes it out, turning it into a rich retelling of Rumpelstiltskin, rife with layered characters and a setting that seems to leap right off the page. The people in the village really come to life. The village of Shearing is steeped with superstition and lore, the mill being the center of it all. One of the most interesting things for me was how the mill really became another character in the book. It communicated with Charlotte and she obviously loves it like a member of her family. This is a book to lose yourself in, a deep story you can really sink your teeth in. There's a bit of romance and a lot of creepy moments. People stick up for each other and people betray each other. Ooh, and best of all... there's an author's note! Hand this one to fans of rich fantasy stories like The Goose Girl or East or Cynthia Voigt's wonderful Jackaroo (and other Kingdom books). 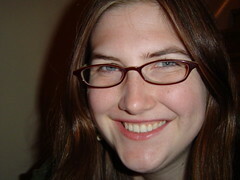 Elizabeth C. Bunce is a member of the Class of 2k8 and you can find other reviews at Book Nut, The YA YA YAs, bookshelves of doom, Sarah Miller's blog, and Miss Erin. I have an ARC of this sitting at home-- I can't wait until I get to it! Book Review: When Is a Planet Not a Planet? 48 Hour Book Challenge, etc. How are you celebrating National Poetry Month? ?